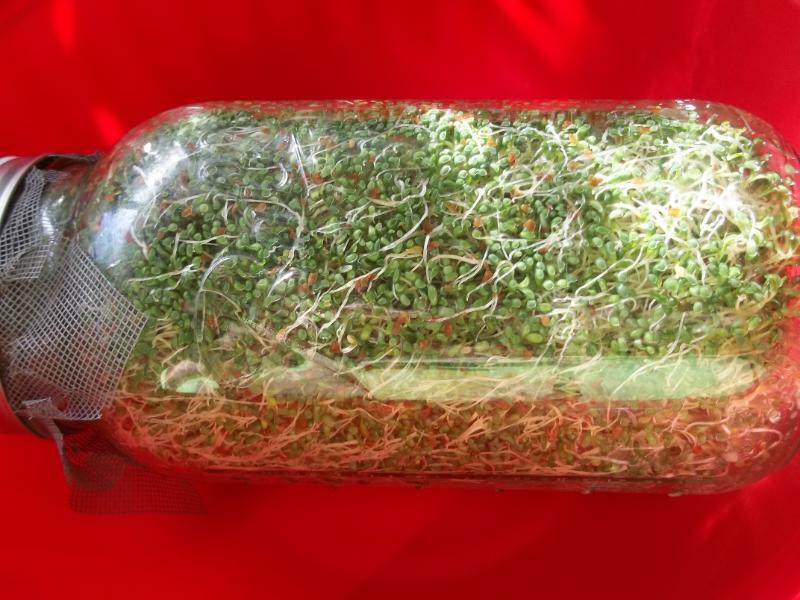 Growing Alfalfa Sprouts at Home – Fun & Easy! We covered growing sunflower sprouts in our last post. This time I will explain how to grow alfalfa sprouts. They are very easy to grow and cost effective! Two tablespoons of those tiny little seeds can fill a whole half gallon glass jar. Select high quality organic seeds for sprouting and soak them for twelve hours. I usually soak mine in the evening so they are ready to go the next morning. This post covers alfalfa sprouts but the method will work for any small seeds like clover, broccoli, and radish. You can even mix them together. After soaking rinse the seeds twice and you are ready to grow! Growing the sprouts is very simple. You have several options of what to grow them in. They make sprouting systems that you can purchase but I use a mason jar or even a sprouting bag (http://www.e3live.com/all_products/nut_milk_sprouting_bag.html). A sprouting bag is very simple to use. You hang it near your sink and simply rinse it several times each day to water your sprouts. A mason jar needs a lid that allows you to rinse and drain the water without losing any seeds. You can purchase one or fit some screen or cheesecloth under the ring of the jar. When using a glass jar make sure you keep it at an angle with the opening down so the extra water can drain out to help prevent mold. One tablespoon of seeds should give you approximately 1 ½ cups of sprouts. Keep your sprouts moist and out of direct sunlight for the first four to five days. When they are close to the size you want for eating (1/2 to 1 inch) put them in a window for the next day or two so they can use the sunlight to turn dark green. When you are ready to harvest your sprouts (1 ½ to 2 inches) give them a final rinse and let them dry. There is no cutting or extra step involved with your smaller seed family. They will keep in your fridge for five to seven days. Store them in a container with a paper towel to absorb extra moisture and keep them crisp. Growing Sprouts Can Be Fun & Easy! We’ve covered why growing sprouts is good for you in a previous post, but I wanted to share how easy of a process it is to grow them. In this post I’m going to cover sunflower sprouts. This is my absolute favorite to grow and eat. They are rich in chlorophyll, protein and nutrition. Add them to your salad or even a wrap. My kids eat them right out of the bag! Purchase high quality organic seeds for sprouting. Not only are they healthier and chemical free, but I find there is a higher sprouting rate with the organic seeds. Store them in a cool or cold dry location and plan to use them within two years. The longer you store them the lower your germination rate will be. That means that not as many of your seeds will sprout. 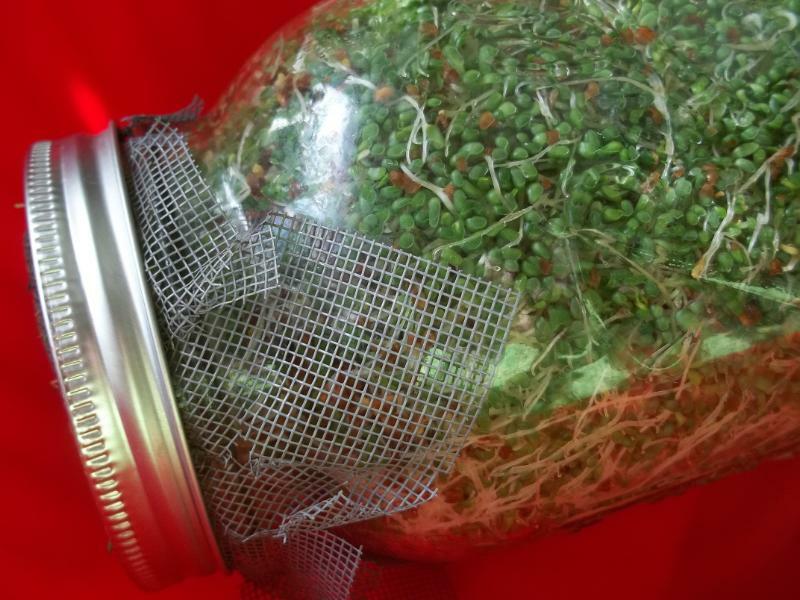 To grow your sprouts first you must soak your seeds for at least eight hours. Soaking your seeds will bring them out of dormancy so they are ready to grow. I soak mine overnight, or even up to twenty-four hours, depending on the type of seeds. Rinse the seeds and make sure they are clean (no rocks, sticks, empty shells) – then put them in a mason jar. The amount of seeds you soak and grow will depend on the size of your jar and tray you are planting them in. If you use a full size gardening flat you can expect to plant approximately three quarters of a cup of seeds per tray. If you don’t have a special sprouting lid, any other type of mesh product will work. Use a ring on your jar to hold the mesh over the opening. Our nut milk and sprouting bags work well for rinsing seeds. Rinse your seeds twice and fill the jar with water. I take an extra step and soak the seeds with a tablespoon of liquid kelp to increase the germination rate. You can also add food grade hydrogen peroxide to your soaking water to sanitize the seeds. mine) and evenly spread them on your tray. Water them and cover the tray with another tray or a damp paper towel. Sprouts do not need a lot of special care. After two to three days you can remove their cover and a bright window will provide them enough light. Keep them moist by watering them once or twice per day. You do not want them to be too wet or they will grow mold. 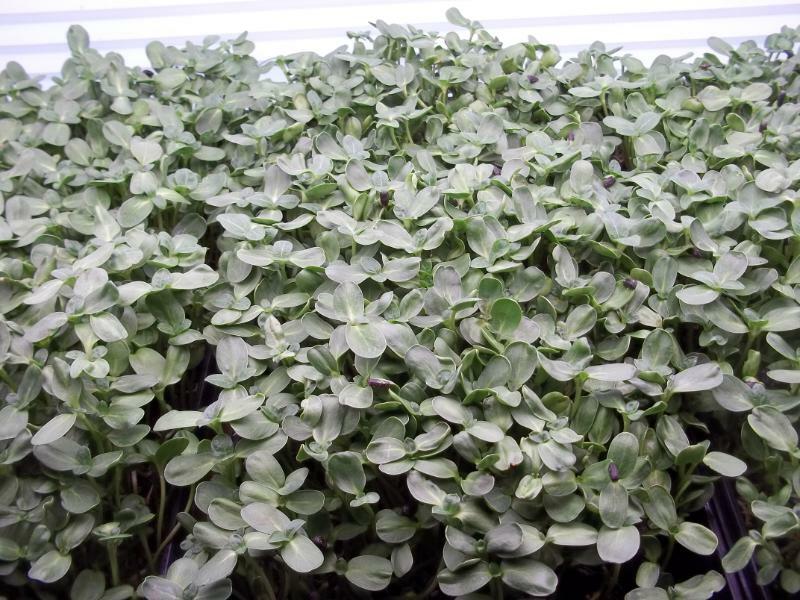 Harvest your sunflower sprouts before their second set of leaves have fully developed. It’s best not to water them the night before you harvest so they are dry – which makes it easier to pull off any remaining seed hulls and they will also last longer if they are not damp. To harvest your seeds cut them off close to the soil line with a sharp knife or scissors. Brush off any hulls and discard discolored sprouts. Store them in a plastic bag with a paper towel to draw away any excess moisture. Sunflower sprouts should last in your fridge for about a week (unless you eat them sooner!). Growing sprouts is easy! The time and effort you put in to them is minimal other than harvesting, and the resulting fresh food is worth it! Next time I will cover growing alfalfa sprouts. What are your favorite sprouts to eat? Growing Sprouts at Home – Easy & Delicious! Sprouts are the delicious and crunchy. 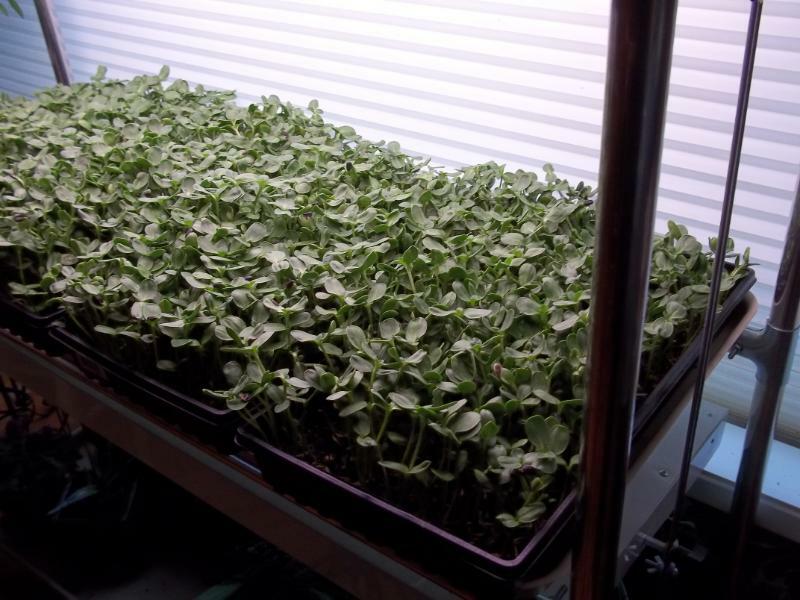 They are plants grown from edible seeds (usually alfalfa, clover, sunflowers, but your options are endless) that are grown anywhere from a few days to a week. They are very nutritious and can be included in almost any diet for health benefits. Growing your own sprouts is really easy and worth the effort! Here are some things to consider if you are new to growing your own. Sprouts don’t take a lot of space – sprouts can be grown in the smallest of spaces in your kitchen. You have several options including sprouting trays, kits or even just a mason jar. Sprouting doesn’t require direct light or an overly warm space. Pick a spot near water and a window and you will have sprouts in no time! Our sprouting/straining bags also work great and are reusable: http://www.e3live.com/all_products/nut_milk_sprouting_bag.html.Sprouting is less expensive – sprouting your own seeds is much cheaper than buying sprouts at the store. For the same several dollars you would pay for a small container, you could purchase enough seed to grow many times the amount of fresh sprouts. You can also customize your blend of seeds to match your preference or needs.Sprouts don’t take a lot of time – sprouts grow quickly and easily. Make sure they are watered on a regular basis and ignore them until they are ready to eat. They are one of the most rewarding things to grow and you can set a routine to provide them to you weekly. It’s much quicker than waiting on a garden. Sprouts are delicious – fresh sprouts are amazingly delicious and nutritious! These barely grown plants pack a nutritional punch that can be enjoyed on sandwiches, salads, and even in smoothies. Most sprouts are mildly flavored and have a nice crunch to them. We will show in an upcoming post how to grow some sprouts from start to finish. Growing sprouts is a great way to extend your food budget and improve your health. Give it a try! You’ll be amazed at how simple it is. What kind of sprouts do you enjoy growing? We’d love to hear about your sprouting adventures in the comments below. Straw Bale Gardening – Grow a Garden Almost Anywhere! Have you ever wanted to build a raised bed for your garden but didn’t have the materials or enough money? Gardening in straw bales is a cheaper and eco-friendly alternative. It may sound unusual but it’s extremely effective and reduces the amount of labor it takes to garden. Straw is cost effective: Straw bales are cheap. You can get them from your local feed store or farmer. Straw (not hay you feed to animals) is animal bedding and usually ranges from four to six dollars for a large bale. They should be yellow in color and free of mold. It is Versatile: Location is actually one of the easiest things to work out when you are using straw. You can put a straw bale almost anywhere the sun shines for most of the day. If you do not have any room in your yard you can even put them on the concrete of your driveway. You can also stack them and grow your garden vertically. Simply plant your plants on the sides of the bales instead of the tops. Make sure to prepare your straw: Place your straw in the desired location (make sure you don’t want to move it because they are heavy when wet!) You want to put a sprinkler on them for the day and thoroughly soak them. Be sure the leave the strings holding them together on. One the second day cover the top of your bale with a high nitrogen source (I use my own composted manure from chickens) and gently water it into the straw. Let it sit dry the next day and then continue to water your straw for the next one to two weeks. Within a few days your straw should start to decompose on the inside and heat up. Do not plant your plants until the straw goes through its hot cycle and starts to cool down (about two weeks). It is Simple: Planting is easy. You can top your straw with some soil and direct sow your seeds or you can transplant your plants. Use a screwdriver to pull out enough straw for your root ball. Make it somewhat larger and add some extra soil to give the roots an easy place to grow. I use the extra straw I pulled out as a water saving mulch around the base of the plants. Water heavily until your plants are well established. Then you should be able to water every few days. Straw stores an amazing amount of water! You should be able to grow three large plants or up to eight smaller ones per bale. You can also plant herbs on the sides. Straw makes its own compost as it breaks down but you should gently fertilize through the season. Planting in straw means you can also plant sooner and grow slightly longer if you have a short growing season. The straw generates heat as it breaks down. A simple frame with plastic cover will give you a self-heating miniature greenhouse. At the end of the year cut the strings on your straw and add it to the compost pile. 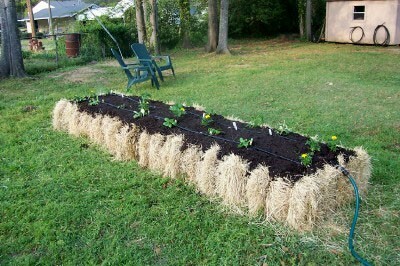 Straw is an extremely easy way to garden in tight spaces. They are raised off the ground for easy access; virtually eliminating the need to weed, are cheap, and good for the environment. What do you use for unique gardening techniques? We would love to hear about them in the comments section. 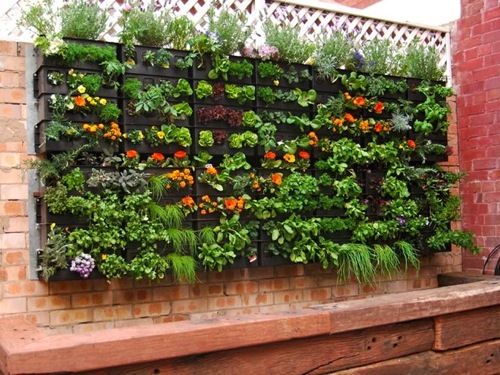 Many of you may have heard lately of something called vertical gardening. It’s quickly rising in popularity, especially in homes with limited space. Vertical gardening is growing up instead of out with your plants. It is a wonderful way to save time, space, and effort! Vertical gardening is a great way to save time as well as your back (from weeding). When you grow plants in raised planters you use less soil. You only need enough for the plants to grow in. This means you have less (if any) weeds. Another bonus is you do not have to bend over. You can plant things as high as you would like. Plants off the ground require much less care than a traditional garden. You can even set up a drip irrigation system to save additional time. Something else to consider is that containers are less accessible to pests and animals that enjoy eating your plants. Gardening up instead of out saves a lot of space in your yard, or if you don’t have a yard it offers you options for growing that you may not have thought of. There are many choices for vertical garden containers, including using pots, planters or recycling materials like old gutters. Anything you can stack or hang will work. Many crops, such as lettuce, require very minimal soil depth to grow. You can use anything from a wall, fence or balcony for your garden. Look for plants that are “bush” variety. They will grow better in your containers. Some trailing vegetables like squash will climb a trellis with proper training. This also reduces the chance of rot. There are some things to keep in mind if you are growing items in containers. The first is that they run out of nutrients faster. Keeping on top of fertilizing will keep your plants growing well. 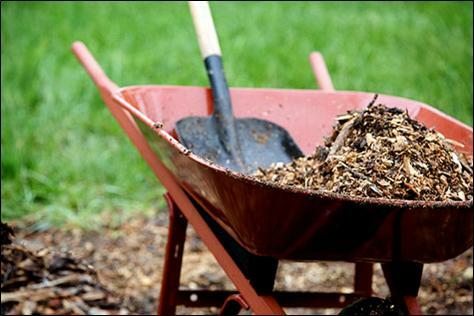 Making your own compost will provide a source of nutrition and also help with moisture control. Plants in containers will also dry out faster so make sure you water more often. Being off the ground they are often exposed to higher heat levels. Plant appropriately for the area your planters are hanging in. Pick shadier spots for sensitive plants. Vertical gardening can be an extremely inexpensive way to provide food and splashes of color to your landscape. It utilizes areas that you may not have considered for planting before. Growing some of your own food reduces your impact on the planet. The food you grow is also healthier (make sure you grow organic) and fresher than any supermarket. If you have extra produce offer it for sale or give it away to your friends and family. You could also learn to can and preserve your own food! Do you have a space or time saving gardening tip? We’d love to see it in the notes section below.